All transactions are safe and secure with a reliable history in online purchasing behind each of our associates. 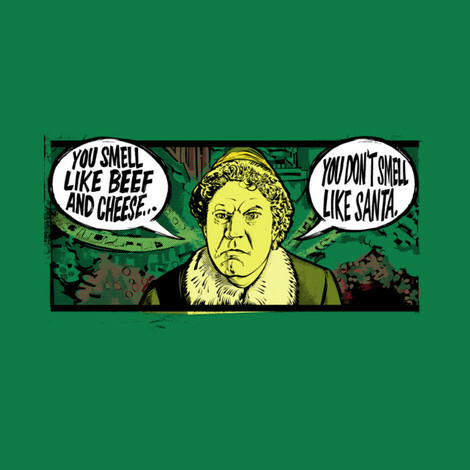 Buy the You Don't Smell Like Santa Elf Movie t-shirt to own Elf clothing and merchandise. Have you ever known someone who always seems to be smiling, even when their world is crumbling around them? Buddy the Elf is a lot like this and it's probably the direct result of being raised by elves, not to mention being surrounded by candy, toys, presents and snow for his entire life. What doesn't make him smile is when he suspects that the Santa at the store is an impostor. "You smell like beef and cheese... You don't smell like Santa." Spread the cheer with this design that features an image of the movie character. Let smiling be your favorite again. In addition to the You Don't Smell Like Santa Elf Movie tee above, browse the Elf Clothing Gallery for more apparel like men's and women's clothes, kids shirts or hoodies.